Choosing the perfect wood types for your furniture project is easier said than done. It is wise to consider not only the color, but the hardness, strength, workability, and other characteristics. 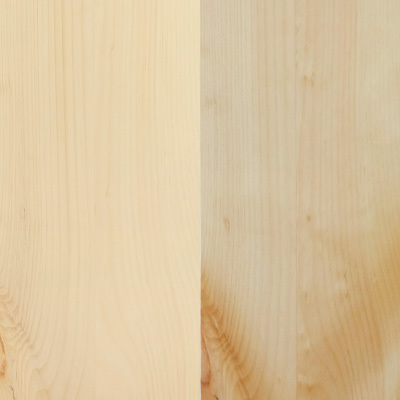 Here we identify wood types and describe their characteristics so you may determine which wood species suits your furniture project best. The finished swatches were produced using clear Monocoat, an all-natural, plant-based, VOC-free and completely nontoxic oil finish. Monocoat finish is exceptionally durable, easily maintained, and provide a subtle luster that reveals and complements the natural grain and patina of the wood. To request free samples of our wood species, or if you require wood other than what is shown here, please contact us. A highly contrasting wood, ranging from a light tan to deep chocolate brown with darker streaks and white sapwood. It is workable, very durable and accepts finish well. A common technique with walnut is to stain the lighter sapwood to match heartwood, though many prefer to simply clear coat it and preserve the natural beauty of the contrasting colors. Walnut has always been a prized material for fine furniture. Is perfect for classic, Mid-Century Modern styles, but versatile enough for traditional and contemporary furniture. 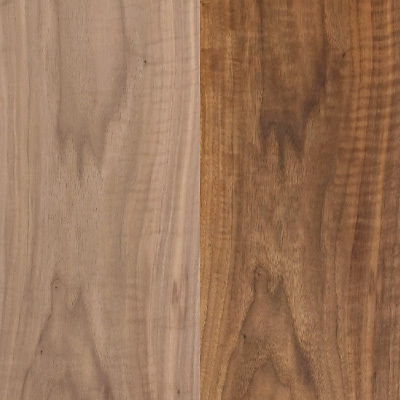 With the scientific name Juglans nigra, it is also called eastern black walnut and American walnut. It is found throughout eastern North America and Mid-Western United States. Walnut has a faint aromatic scent. Has a uniform texture and good natural luster, varying in color from a golden to dark reddish brown. Sapele mahogany is very hard with an interlocking wood grain. This can present challenges when cutting, but otherwise it is a very workable wood. Mahogany is stainable, but it is not recommended, as the shimmer in the natural ribboning will be reduced. Instead, opt for a good oil such as Monocoat. Mahogany is a great choice for millwork and outdoor furniture. Scientific name Entandrophragma cylindricum, also known as sapele, is a large tree native to tropical Africa. Though distinct from genuine mahogany (Swetenia macrophyla), sapele is considered a type of mahogany, as both are in the Meliaceae family. There are hundreds of mahogany species throughout the tropical regions of the world. It has a distinct, cedar-like scent. Upon harvest, the wood ranges from light yellow sapwood to salmon pink. With age, the wood darkens to a deep reddish brown with a golden luster. It is strong, hard, and close-grained. A common issue with cherry is blotching, or uneven coloring, due to how the wood bleaches from sunlight. Setting a vase on a new cherry top in direct sunlight will leave a shadow effect where the vase blocks the sun. To minimize this, use a wood conditioner before staining. Allow the wood time in direct sunlight for a few days before setting anything on it. While we don’t select for sap-free wood, we do guarantee 25% or less sap per leg. This allows you to turn the sap to the inside so it doesn’t show. Cherry is the ideal wood for rich, traditional styles. With the scientific name Prunus serotina, it also known as black cherry, wild black cherry, rum cherry, or mountain black cherry. It grows primarily on the Allegheny Plateau in eastern North America. Cherry has a mild aromatic scent. Freshly harvested, alder is almost white in color, yet fades to reddish, yellowish tan with age. Alder is only slightly denser than pine. It has excellent workability and accepts finish wonderfully. 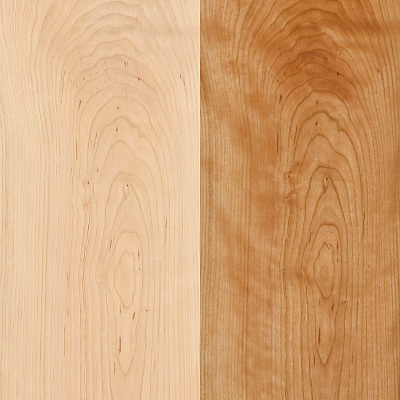 Alder is similar in appearance to cherry, but lighter in both weight and color. Like cherry, alder can develop a shadow effect from the sun. Use a wood conditioner and a durable finish, like Monocoat, to keep it in good shape. Alder is perfect for rustic styles. Known by the scientific name Alnus rubra, it is also known as Oregon alder, western alder, and Pacific coast alder. It grows along the west coast; from southern California all the way up to Alaska. It has no characteristic odor. Typically a brownish red with golden tones. It is course-grained, strong, heavy, and very workable. Because it is porous, it accepts stain beautifully, but must be grain filled before painting. Red oak was often used in Victorian furniture. Its scientific name is Quercus rubra. It is also known by the names gray oak, eastern red oak, mountain red oak, and common red oak. This hardy wood grows along eastern North America from northern Quebec to southern Louisiana. It has a mild acrid odor, which fades with time. 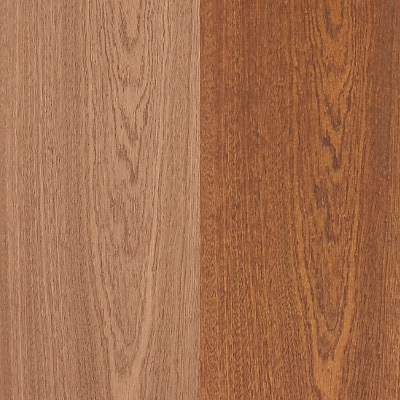 Ranges from a light to dark brown, and has a more impressive ray fleck than red oak. Over time, it ages to a rich brown. This is a highly workable wood, very stiff, heavy, and durable. It accepts finishes well. Due to its tighter grain, it does not require grain filler like red oak. White oak is the signature wood of Mission style. Scientific name Quercus alba, it also known as stave oak, ridge white oak, and fork-leaf oak, grows along the entire Atlantic seaboard, extending as far west as Texas. It has a lightly acrid, sweet scent. 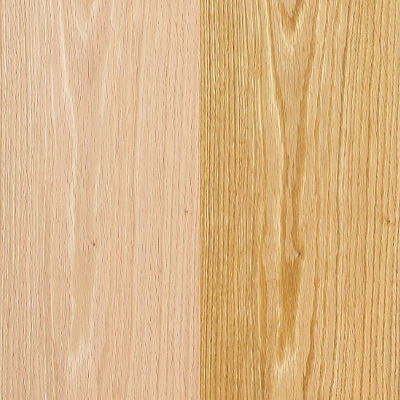 Sapwood ranges in color from blonde to a light reddish brown, taking on a golden hue as it ages. Heartwood ranges from light brown to chocolate. 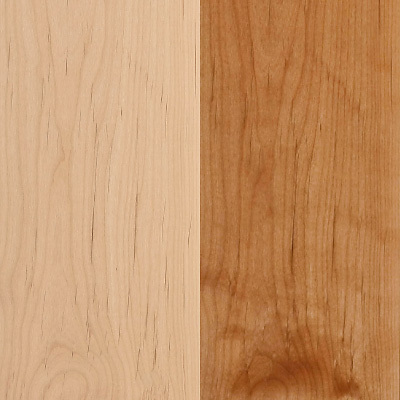 Soft maple, despite its name, is very durable. 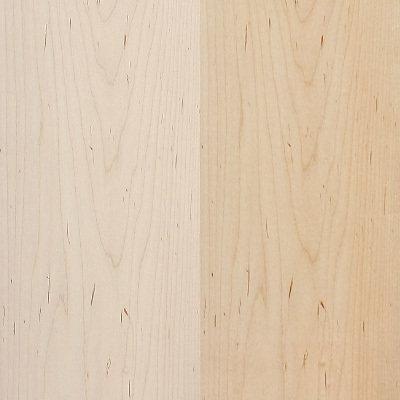 Our soft maple is ideal for painting, though high color variability makes it less ideal for staining or finishing. If you require maple with low variability for staining or finishing, let us know and we’ll do our best to select for consistent color. You may specify this under “Order Instructions/Comments” during step 5 of the checkout process–“Order Confirmation”. 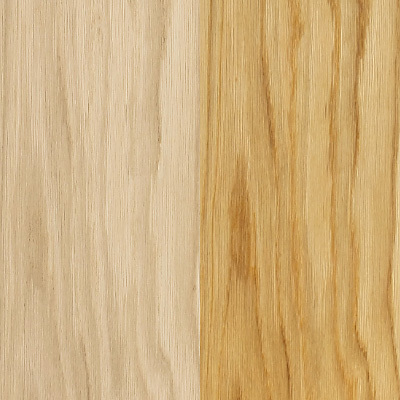 As one of the most popular wood choices, soft maple is used in traditional, transitional, and contemporary styles. Though “soft maple” is a term used to describe several species of softer maple, we use only the hardest of the soft maples, Acer rubrum. This species is also known as scarlet maple, water maple, and red maple. It grows throughout the eastern US. It has no characteristic odor. Ranges from white sapwood to a pumpkin/golden heartwood. Heartwood darkens to a rich golden brown, sapwood to a golden yellow. It is very soft and light. Prominent knots and streaks show through even the darkest finishes, and the wood dents very easily. Use a wood conditioner or sealer before applying any stain. If painting, use a few coats of primer before applying paint. Pine was often used in rustic, primitive country furniture. With the scientific name Pinus strobus, it is also called eastern white pine, northern white pine, Weymouth pine, and soft pine. It grows mostly in colder regions of eastern North America, from Newfoundland west through the Great Lakes and south along the Appalachian Mountains to northernmost Georgia. White pine has a mildly resinous scent. A bit lighter than soft maple, ranging from blonde to chocolate, with a reddish or golden hue. 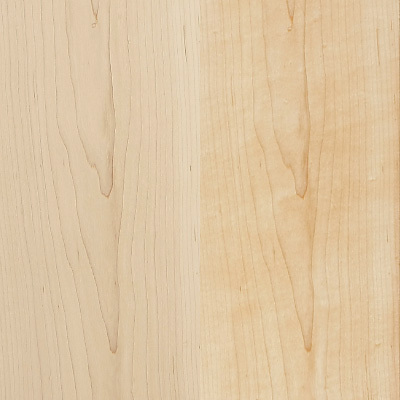 Hard maple has a fine, even grain texture, like soft maple but with a higher density. It is very workable despite its hardness. It does tend to blotch while staining, so a wood conditioner is recommended. Hard maple is often used for light, contemporary styles. Scientific name Acer saccharum, hard maple is also known as sugar maple and rock maple. It grows across Northeastern North America, from Missouri and Tennessee up and across to Nova Scotia. It has no characteristic odor.